“One thing is certain. There doesn’t appear to be a simple solution to any of this.” Veronica shrugged, folding her hands on her lap. A few weeks ago, Titan Books offered advanced copies of George Mann’s The Executioner’s Heart for review. While mine is in the mail, I thought I’d better play a little catch up, starting with The Affinity Bridge, first of the Newbury and Hobbes series of Steampunk mysteries. Mann’s Steampunk adventures have been on my “intent to read” list for a while now, and this seemed a good opportunity to meet Sir Maurice Newbury and his plucky assistant, Ms. Veronica Hobbes, following their exploits around a reimagined London, where wondrous airships inhabit the skies, deadly revenants plague the streets, and murder is in the air—or at least the back streets of Whitechapel. The year is 1901, and Victoria is still Queen due to the ministrations of her personal physician, who has artificially extended her lifespan through the wonders of both modern medicine and engineering. Sir Maurice Newbury is one of her foremost Agents of the Crown. An academic at the British Museum, dabbler in the Occult, and occasional laudanum addict, Newbury brings his inquisitive mind and deductive ability to any situation the Queen demands. He also finds himself on loan to Scotland Yard and Chief Inspector Sir Charles Bainbridge from time to time, utilized on cases requiring a unique perspective. At the moment, Newbury is consulting on The Case of the Glowing Policeman, wherein a series of murders in and around the Whitechapel district has baffled the regular police force. Naturally, every good detective needs a stalwart companion, and in this case, the honour falls to Newbury’s newly hired assistant, the comely and intelligent Ms. Veronica Hobbes. She’s not so much an assistant as she is a partner in his investigations—a modern woman determined to make her mark in a world dominated by men. Her sharp wit and deductive skills compliment Newbury’s own, and her femininity puts those who might otherwise be reluctant to talk at ease. Manners, after all. She also has a few secrets that we as readers are privy to, but which Newbury will have to discover on his own. The Affinity Bridge is no simple murder mystery—glowing policeman notwithstanding—for as an agent of the crown, it is Newbury’s duty to be at the beck and call of his monarch, and when an airship crashes in central London with numerous casualties, that call comes. Her majesty is concerned, as the airship was piloted by one of Chapman and Villiers astounding automatons, artificial pilots claimed to be foolproof. Was the accident proof that they aren’t, or was it foul play? Their investigation will lead them into a diabolical tale of murder and mayhem through the fog ridden streets of London and eventually above, culminating in a flight above those same streets in an out of control airship. Of course, there is the matter of the Affinity Engine, but since it bears directly on the resolution of several mysteries, you should be allowed to find out about it on your own. Sir Maurice Newbury is an intriguing character. Like the iconic Sherlock Holmes, he is a master of observation, yet slave to his appetites. Whereas Holmes used cocaine recreationally in an attempt to alleviate his boredom between cases, Newbury uses laudanum in an attempt to forget the horrors he has seen, perhaps elicit a breakthrough when stymied by a case, or even to breach the boundaries between reality and the spirit world. He sees his addiction as a necessary failing, yet propriety keeps him from either seeking help or acknowledging the weakness. Like Mr. Holmes, Newbury has some skill with both his fists or a blade, prerequisites of an agent of the crown, recalling the image of a Victorian Bond. No word on his license to kill, however. Newbury is also a dabbler and believer in the Occult, something Holmes was generally incredulous of. Veronica Hobbes brings her own intrigue to the novel. Seemingly just a feminine version of Dr. Watson to Newbury’s Holmes, she’s very much as canny as Newbury, and has her own secrets. Hobbes is much more grounded than Newbury, and takes it upon herself both to protect his image and subtly keep him from harm when the laudanum takes over. She’s a relatively strong female character, holding her own in a time and place where man’s chauvinism still runs deep. I suspect as the series progresses, we’ll see Veronica come into her own as both an investigator and possible paramour for the brilliant, yet troubled Newbury. One cliché, or rather trope, of the Steampunk genre is the idea of the “Agent of the Crown. ” Trope/cliché it may be, but it’s a rather fun idea that runs throughout Steampunk culture and honestly, never gets old. 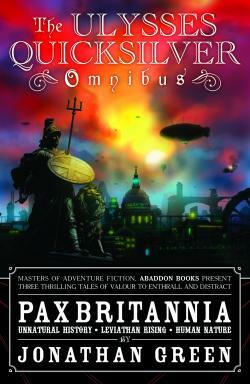 Both Ulysses Quicksilver, of the remarkably wonderful Pax Britannia series by Jonathan Green, and Richard Francis Burton of Mark Hodder’s Adventures of Burton and Swinburne share the title with Sir Francis Newbury. In fact, Green’s Quicksilver could realistically be described as a descendant of Maurice Newbury, or at least of the Universe which he inhabits, what with his introduction as an agent of Queen Victoria, who has managed to extend her reign through means mechanical and medicinal to the year 1997. Alas, Ulysses Quicksilver’s story is for another time. 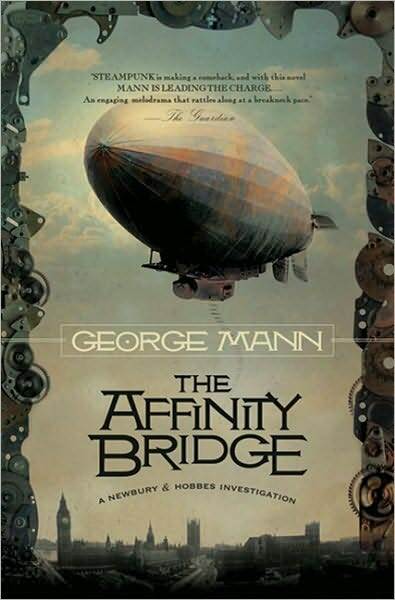 The Affinity Bridge is the first in a quartet of Steampunk novels by George Mann, and if the rest prove as delightful as the first, then I suggest a foray to your local bookstore in search of the adventures of Newbury and Hobbes. Preferably by Steam Carriage. Bloggers note–While finishing my own draft of this review, I managed to breeze through Mann’s sophomore Newbury and Hobbes novel, The Osiris Ritual and if anything, it’s better than the first.